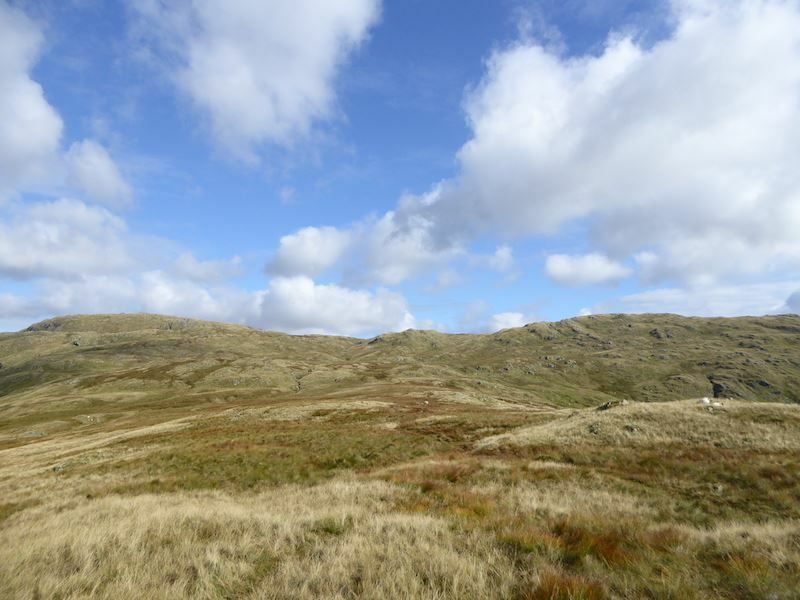 We were in for a dry day today with only a very slight chance of a rain shower so we planned a walk from Sadgill up to Grey Crag and then over to Tarn Crag. We haven’t been to either since 2010 so its definitely time for a revisit. Sadgill is in Longsleddale which isn’t too far from home and so we were there just after 9.00 am and found no other cars parked up in the tiny parking area. It was a beautiful morning by this time, but just after dawn when I first woke up and looked out of the window there was thick mist everywhere, in other words a temperature inversion. When I got up a little later on and looked out again all the mist had gone and in its place was blue sky and sunshine. 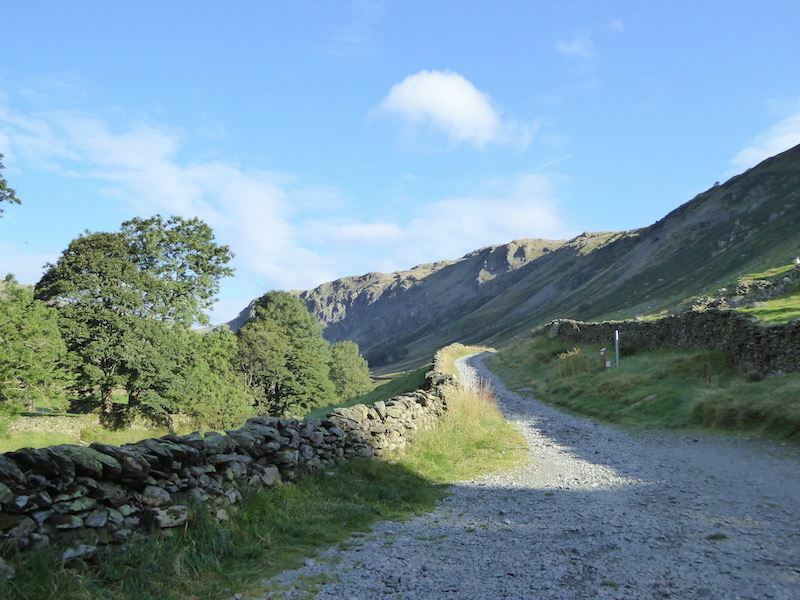 From the Sadgill parking area a look at our route up to Grey Crag. Also from the parking area looking along the track up Longsleddale. Its a fabulous morning and as there is no-one else here we have the pick of the parking spots. 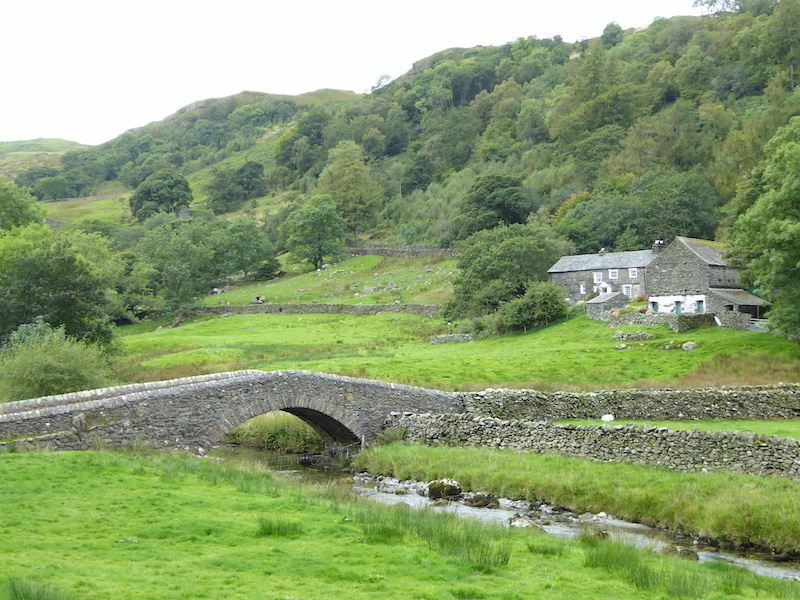 The bridge at Sadgill. There’s nothing sad about this place though, its a lovely little spot. Having parked up and kitted up, especially with gaiters as where we planned to walk is always wet underfoot, off we went through the gate and across the fields to take the path up to Great Howe. 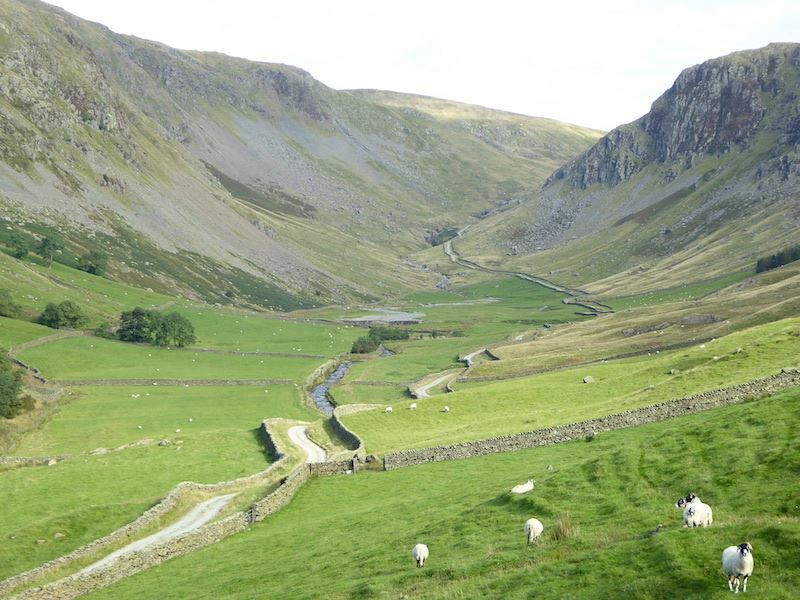 The view up Longsleddale as we start climbing. 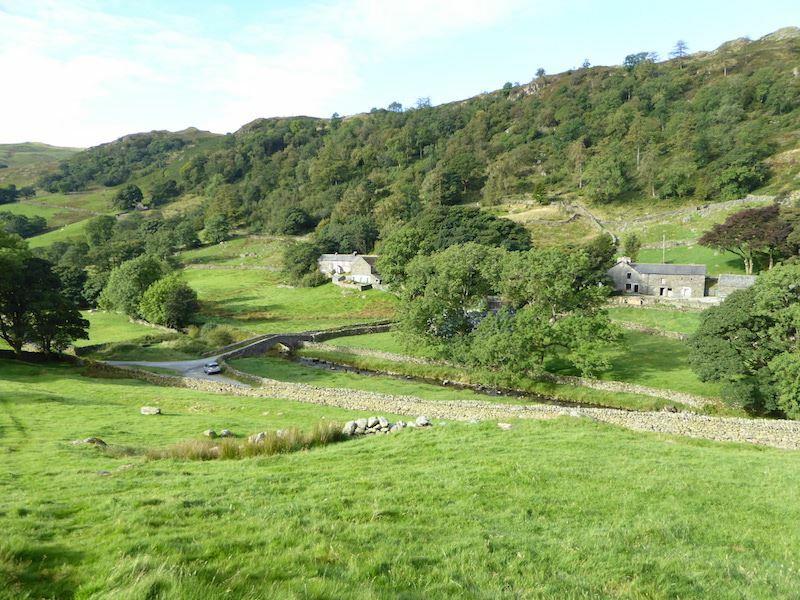 A look back down at the little hamlet of Sadgill, our car is still the only one there. 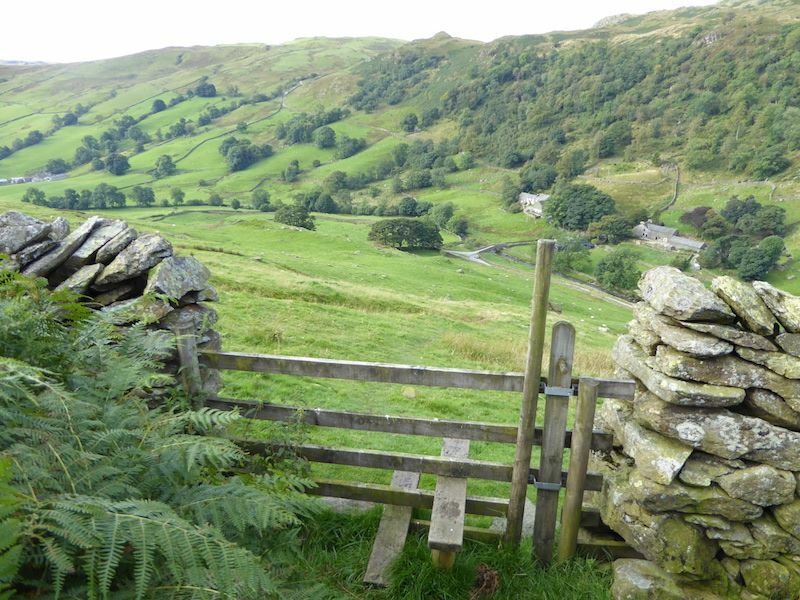 We’re making for the stile in the wall up there, then its fight a way through the shoulder high bracken to the foot of the gully over on the left. Higher still and now there’s an even better view up Longsleddale. A few of the sheep were interested in what I was doing. A trouble free walk over the grass brings us to the stile, now to tackle the bracken which is covering the fell side behind me. Having dealt with the bracken we now have to negotiate Easy Gully. Easy compared to what we asked? 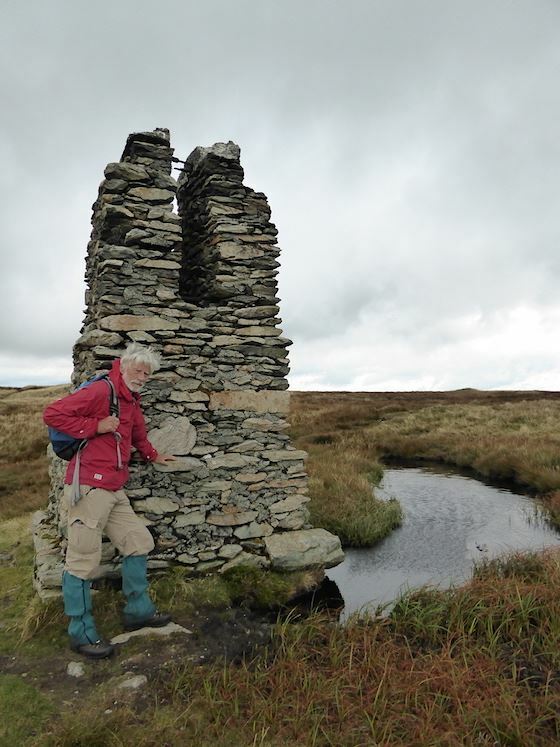 You may now be wondering why waterproof gaiters are being worn when its not wet. That’s because it will be later in the walk. A look back down Easy Gully, not quite ‘easy peasy’ but not too difficult either. 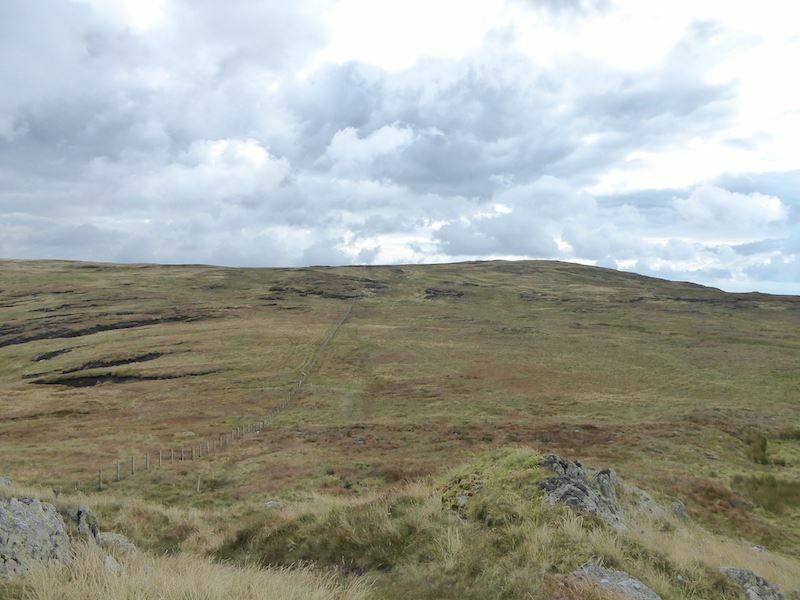 It is quite steep but the worst thing about it was its rough and uneven nature which proved to be very trying at times. From Easy Gully we make our way over to that wall, turn right when we get there and follow it upwards. 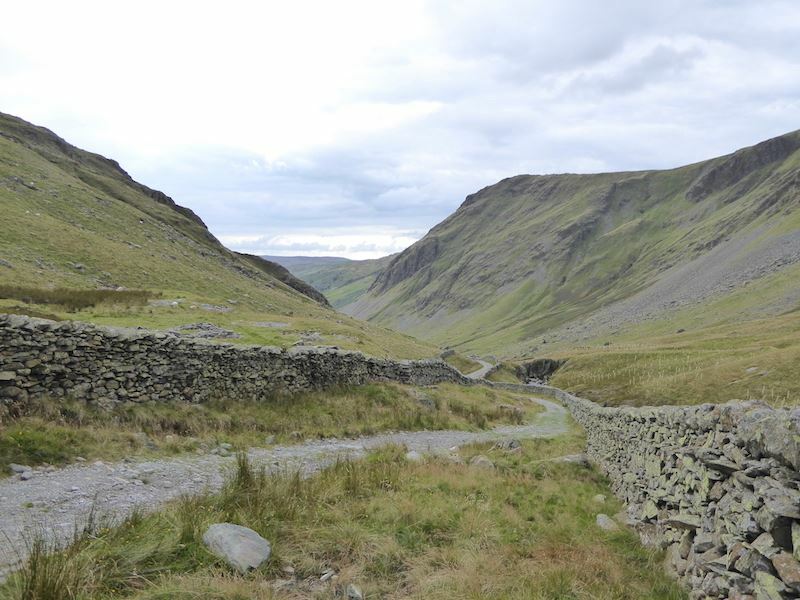 The path runs alongside the wall, and offers a grand view up Longsleddale. By this time my outer layers were off and I’m down to t-shirt level as we, and the temperature, climbed higher. 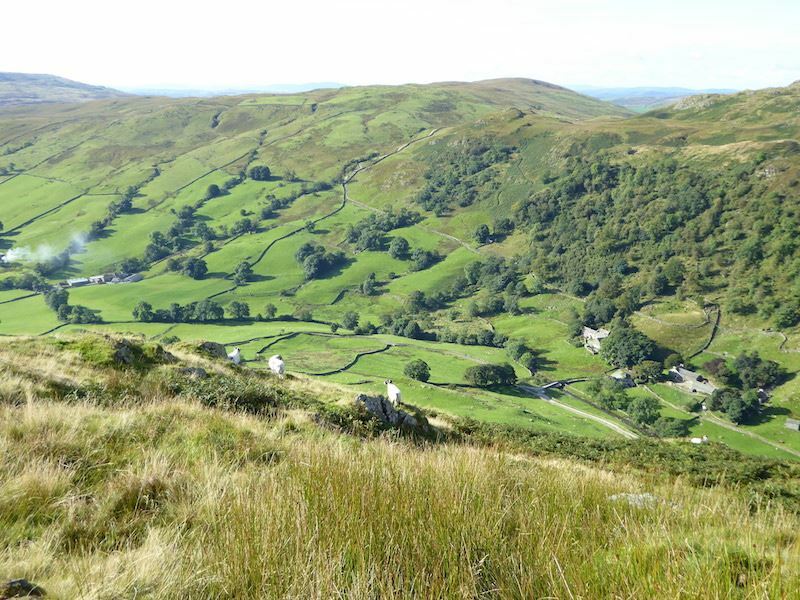 Looking west across the valley, on the left with the knobbles on top is Shipman Knotts, and to the far right of that is Kentmere Pike. 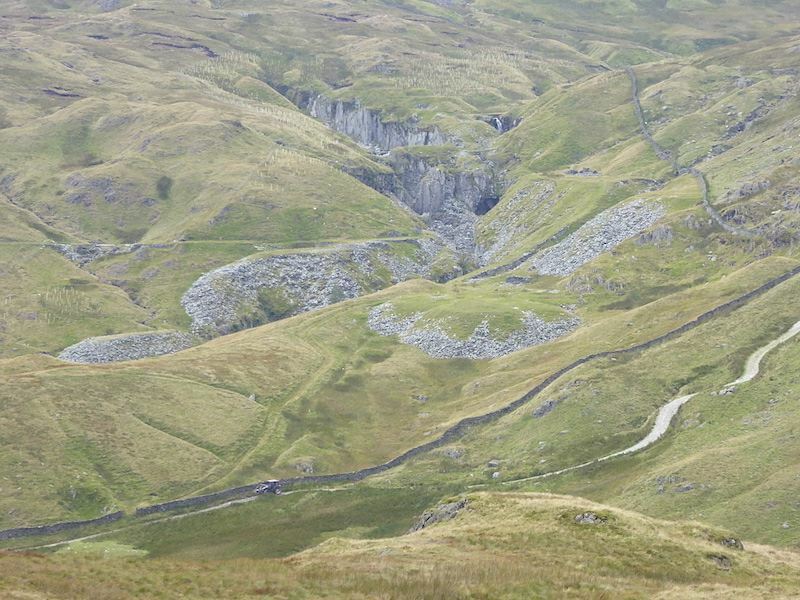 We’re high above Sadgill now and still no-one else has parked down there. The smoke on the left isn’t a wild fire, someone down there has just got their home fire going and making a bit of a puther with it. 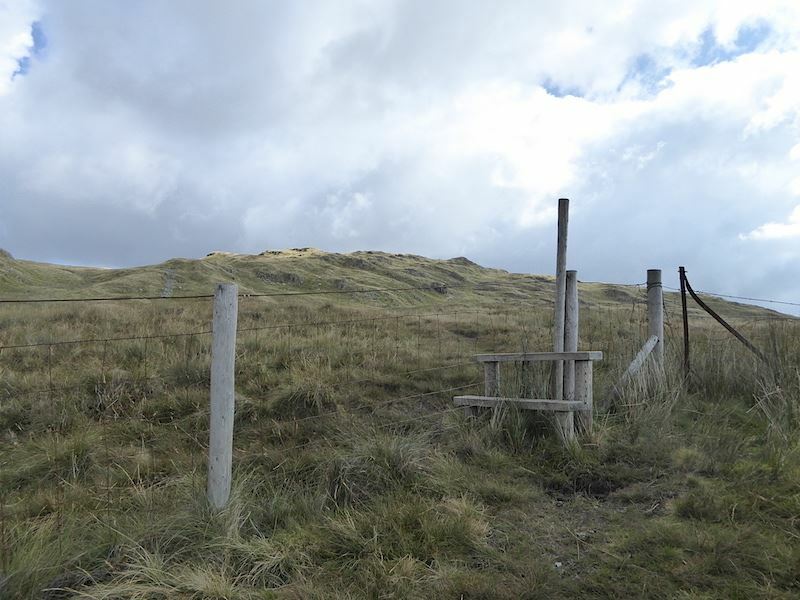 The path alongside the wall leads to this stile which we cross and then head over to the left for Great Howe. 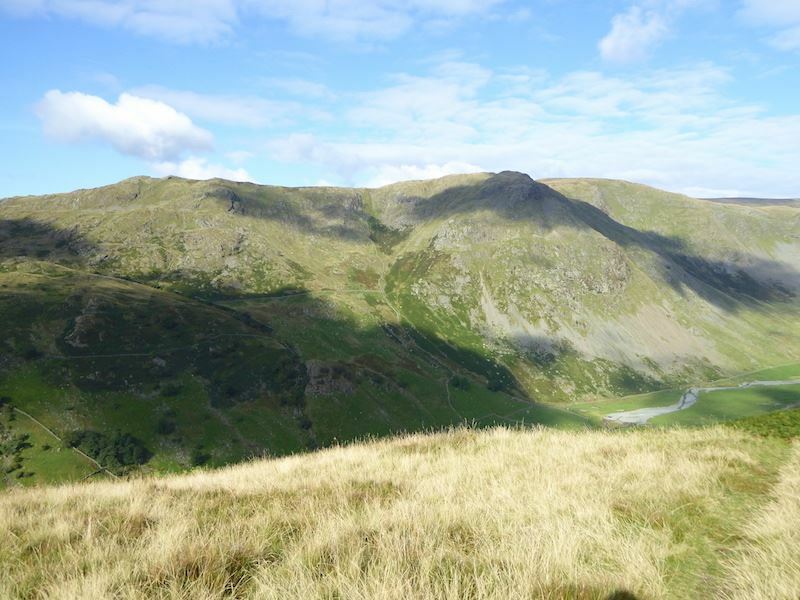 To the left of us, in the top right corner, is Tarn Crag which we’ll go to later on in the walk. 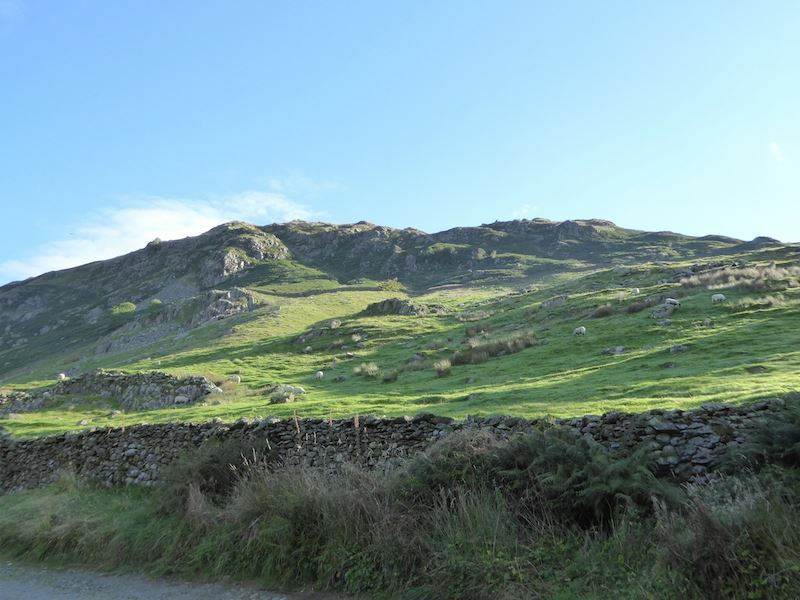 On the left is Buckbarrow Crag. 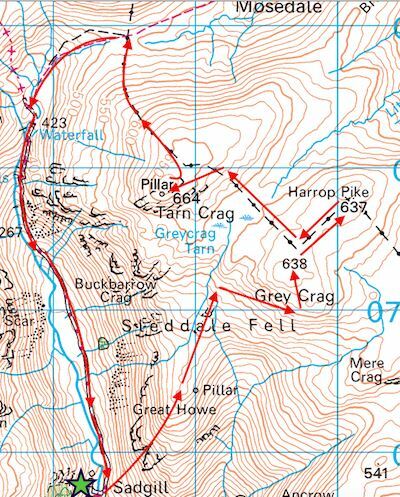 From Great Howe summit we can now see Grey Crag, that’s where we are going next. We had a short drinks stop here and a look round at the views. They were a bit hazy to the south but quite good everywhere else. From Great Howe it was just a case of following the path upwards until we got to the summit of Grey Crag over on the right. 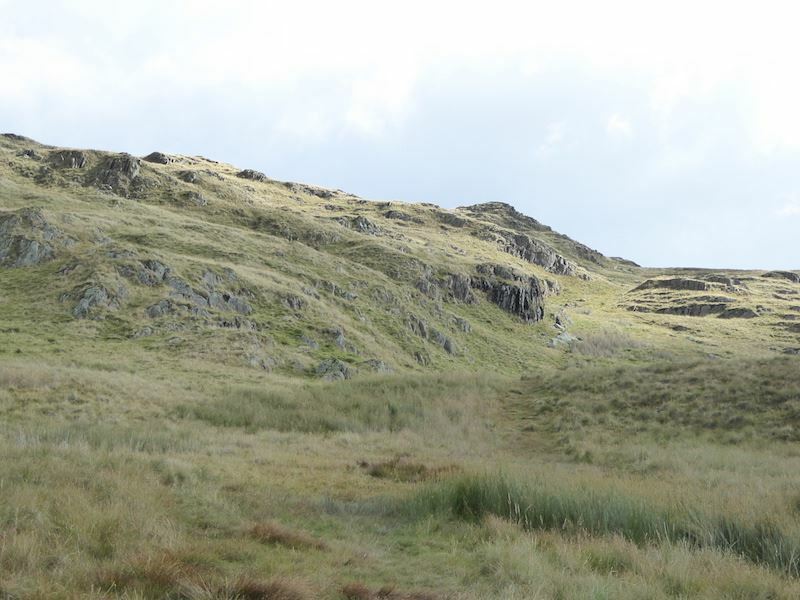 Tarn Crag is over on the left. 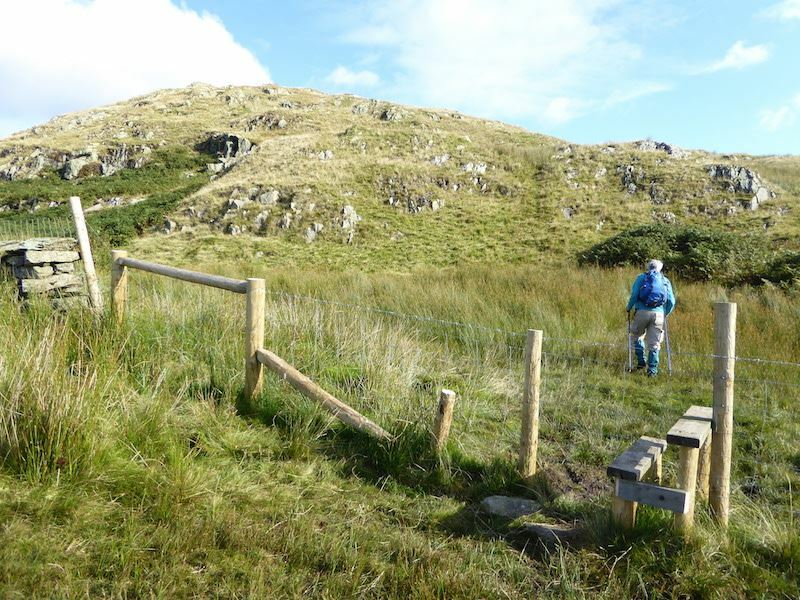 This is where the gaiters come in handy, it can be a very wet area from now on. 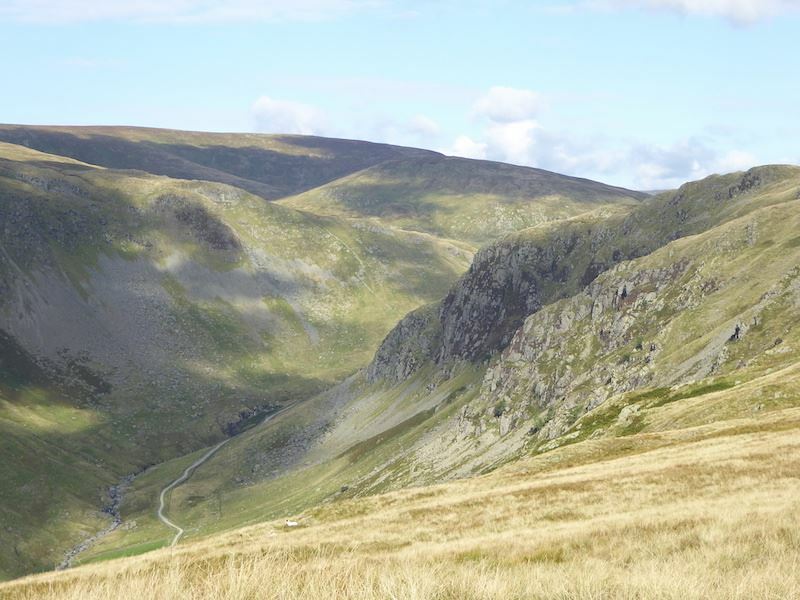 Kentmere Pike in shade in the centre, with Harter Fell to its right. A young lad in his 20’s came bounding past us somewhere along here so we exchanged a few words and off he went again. He was only wearing cycling type t-shirt and shorts and carrying a very small pack so not much weight to slow him down either. 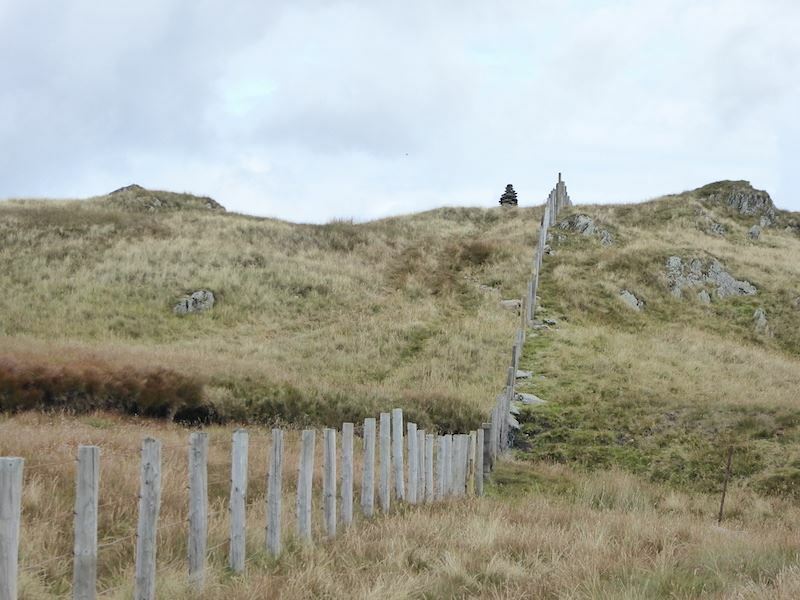 We keep climbing until we reach this fence and then just follow it ……. 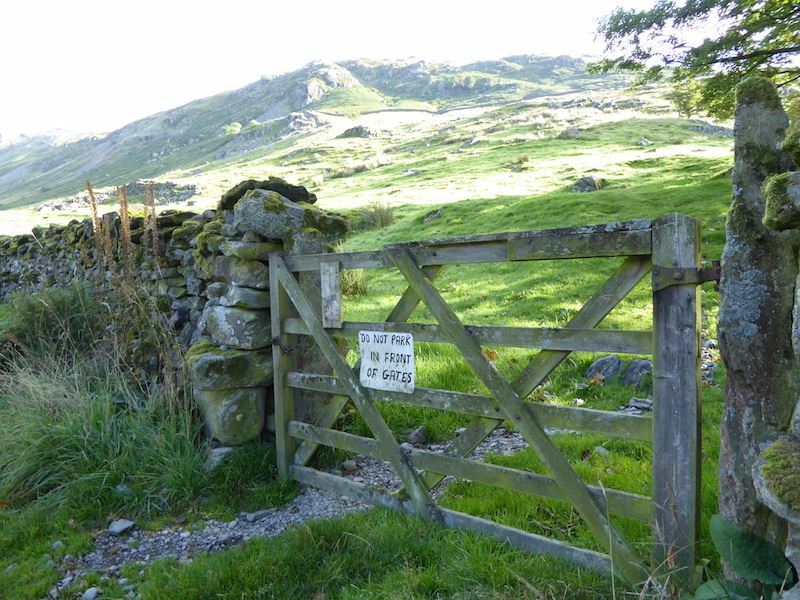 ….. until we reach the stile at the fence. 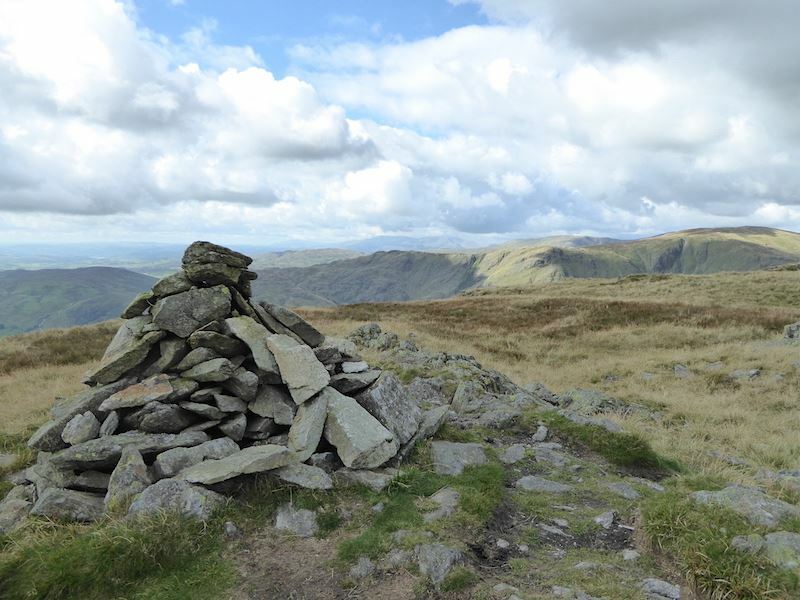 Just above the stile on the skyline is Grey Crag summit. 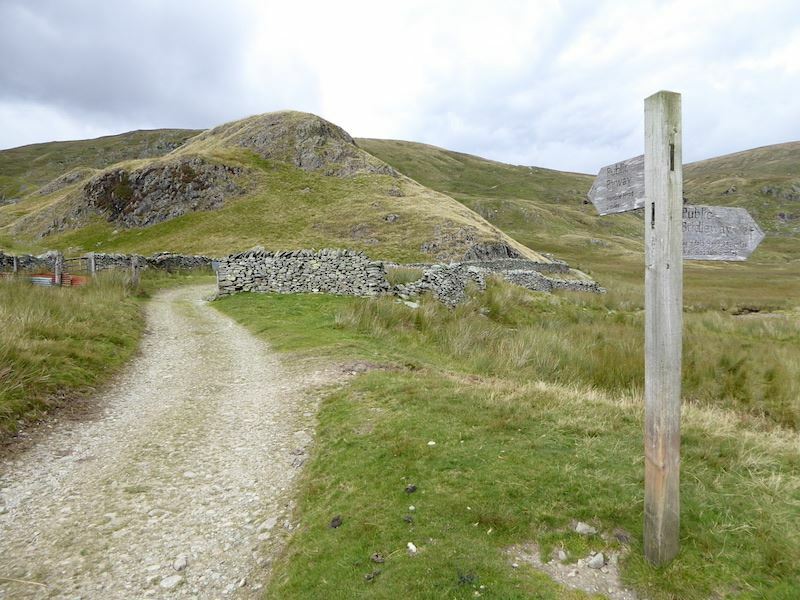 As I crossed the stile and looked back I saw this old survey pillar just below the summit of Great Howe. 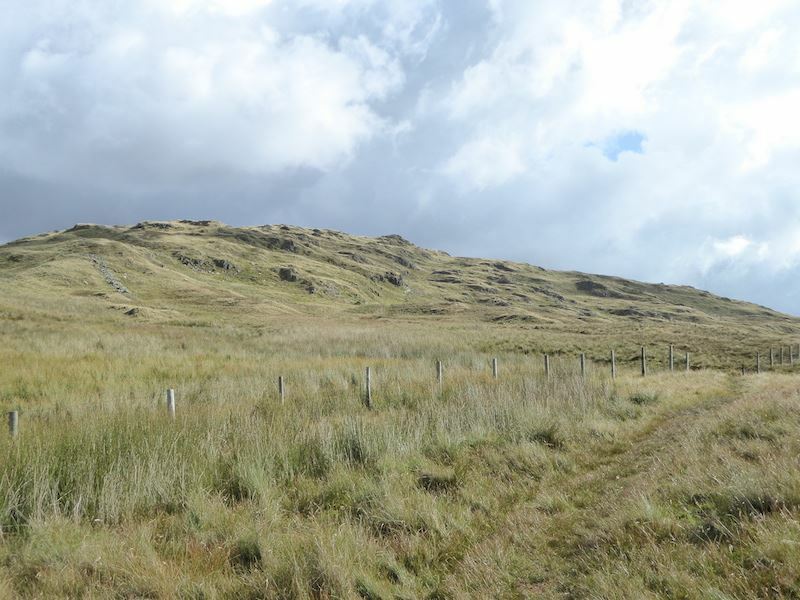 We had meant to walk over to it while we were on Great Howe, but somehow forgot to do so, we were probably talking. 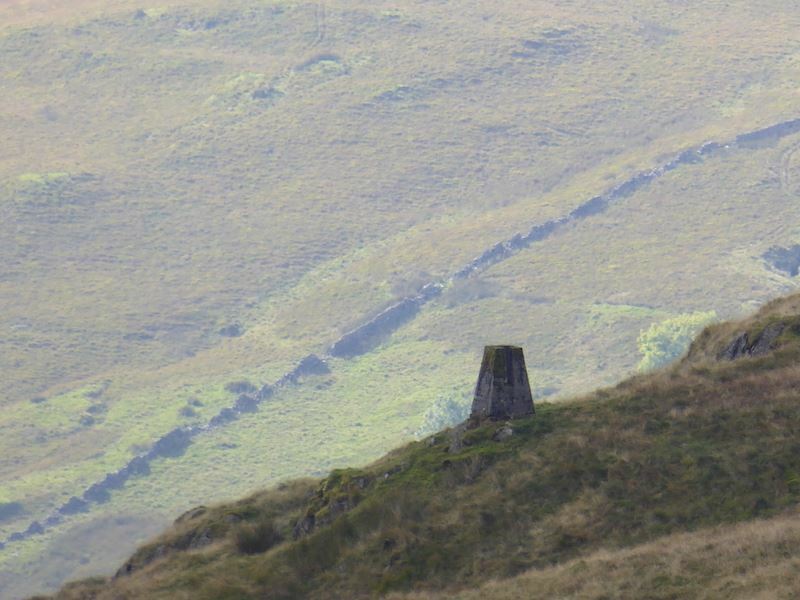 Anyway I took a long zoom shot of it from the stile so its a bit grainy. 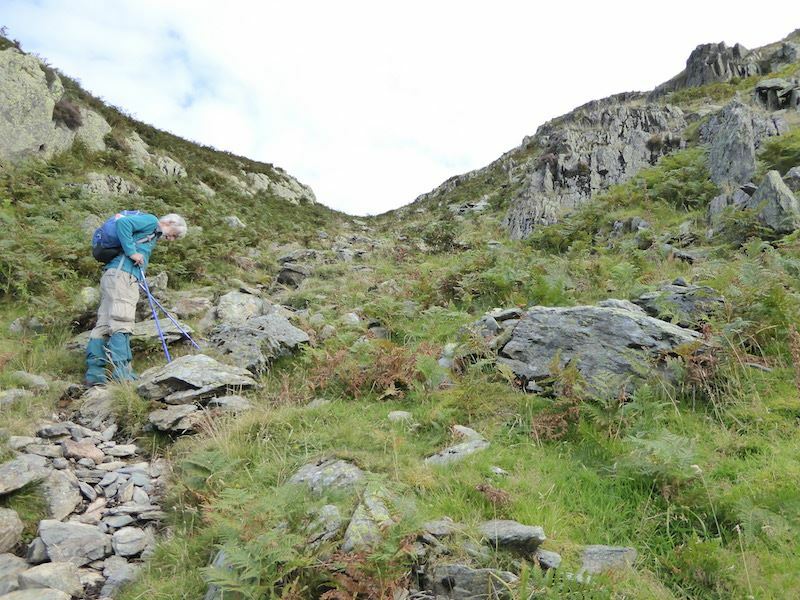 Still following the path up to Grey Crag but there’s not much further to go now. 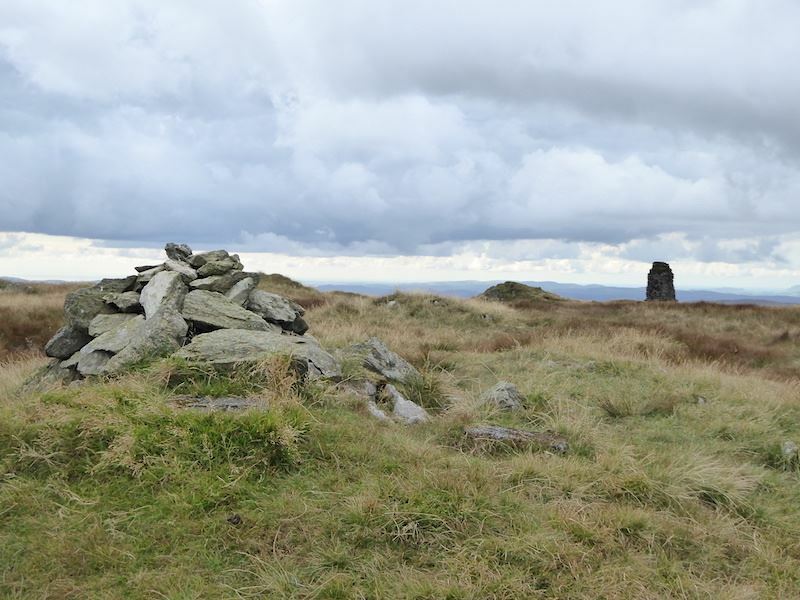 At last the summit cairn comes into view and so did a lot of dark cloud. and that was just about it for the sunshine for the rest of the walk. 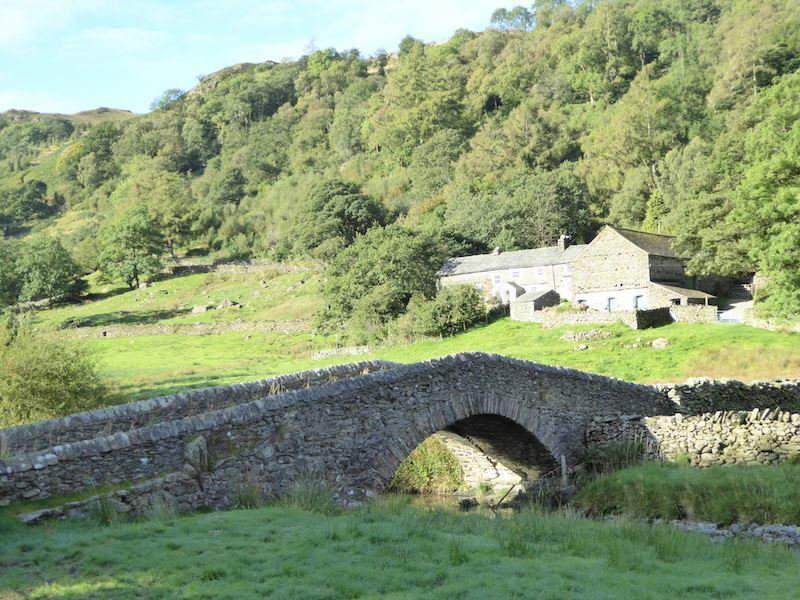 It didn’t feel like the same day we had started off in back down at Sadgill. Still the large grey clouds did not dispense any of their water content over us so that was a bonus at least. 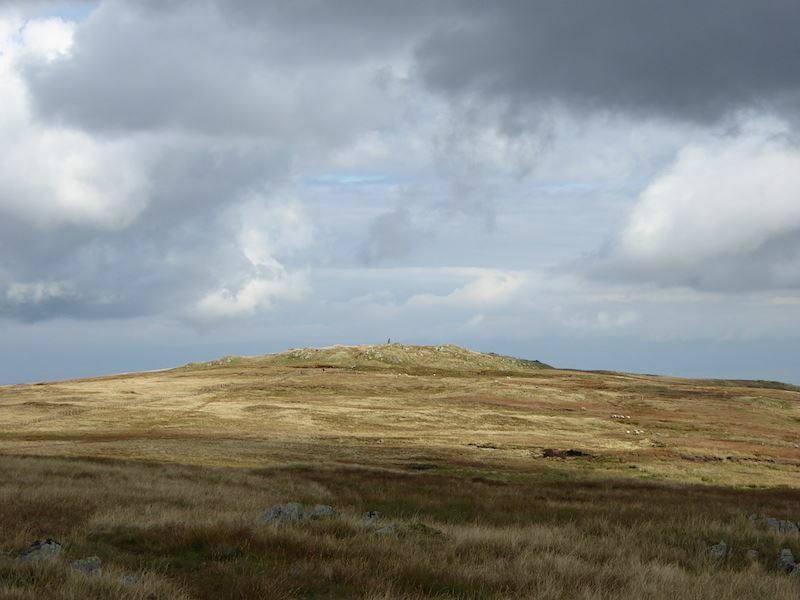 Looking eastwards across the Shap fells from the summit. 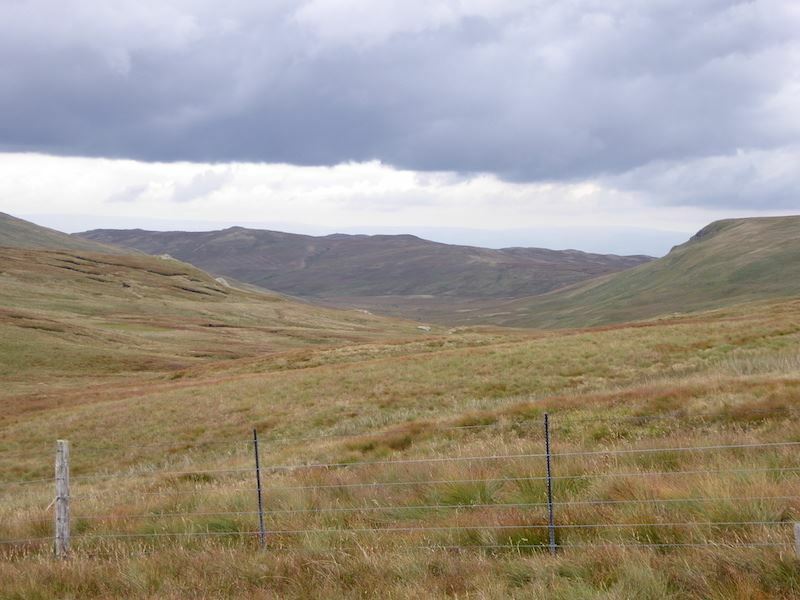 Harrop Pike is just over there, so we might as well go across seeing as its so near. 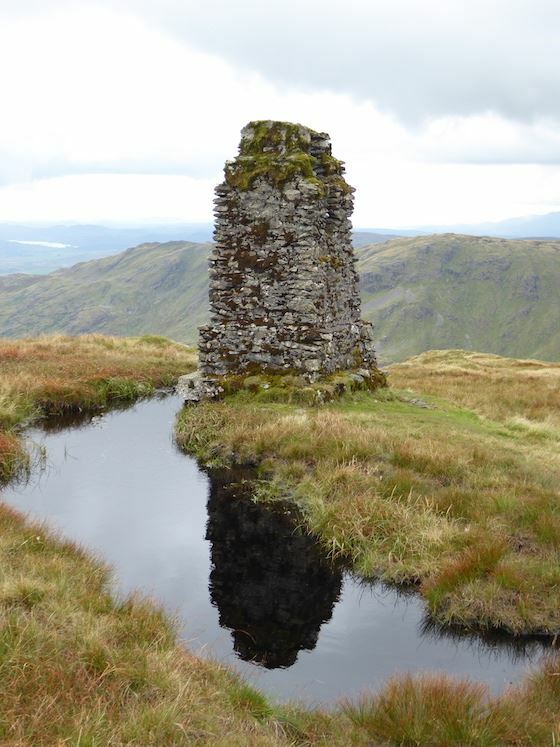 Its only a short detour, although it is quite a boggy route over, but worth it for the splendid cairn to be found there. 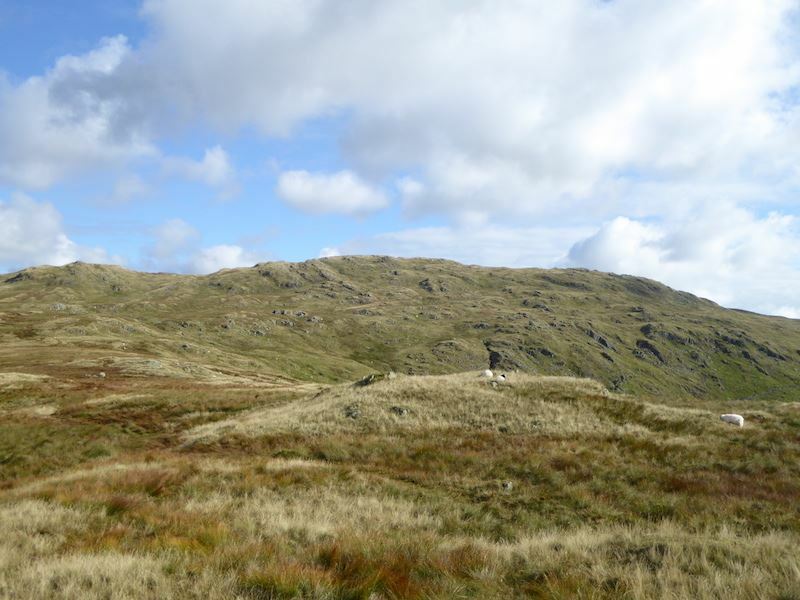 One more hump to climb before we reach Harrop Pike. 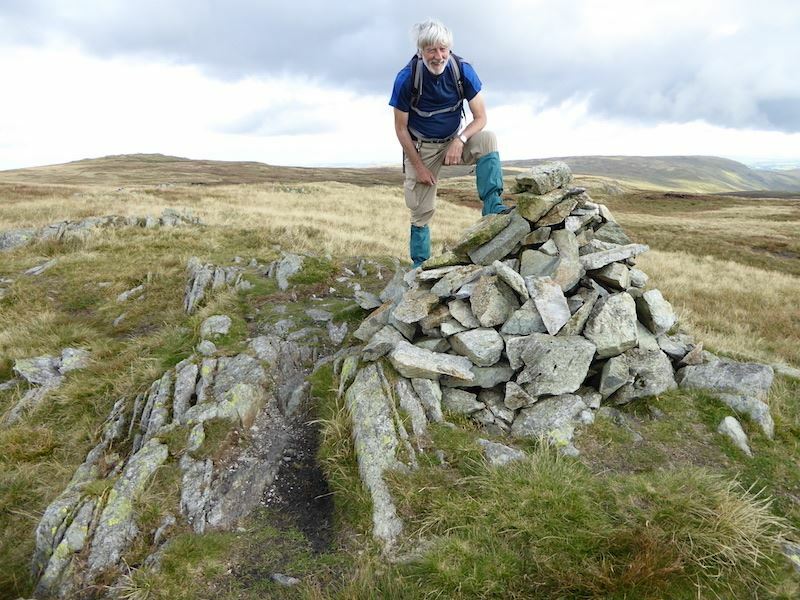 Harrop Pike’s rather splendid summit cairn. 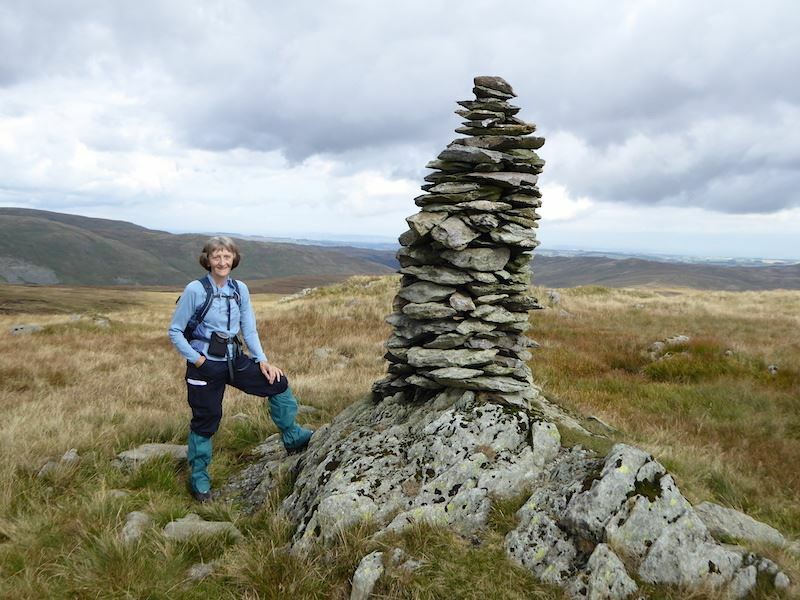 The leaning tower of Harrop Pike. Notice the long sleeved layer is back on now that the sun has retreated behind the thickening cloud. 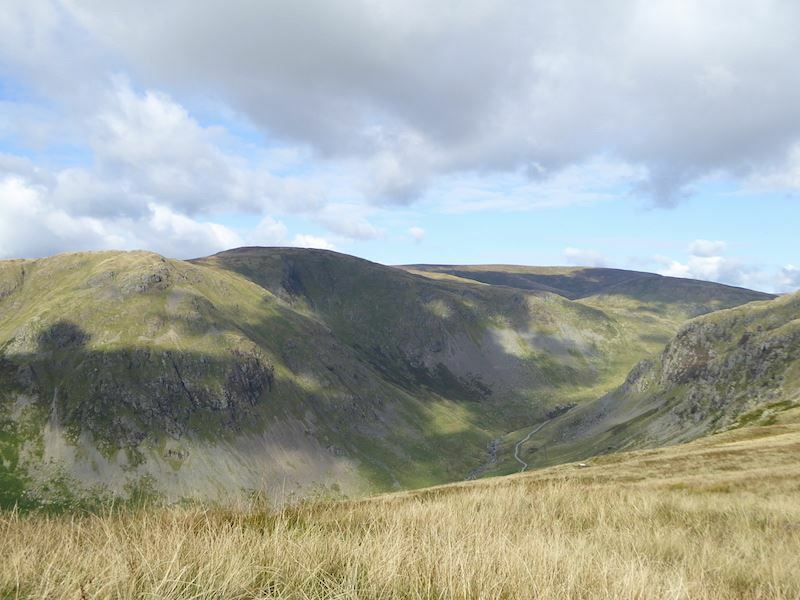 Making our way to Tarn Crag, the long ridge on the right skyline. This is another very wet area. 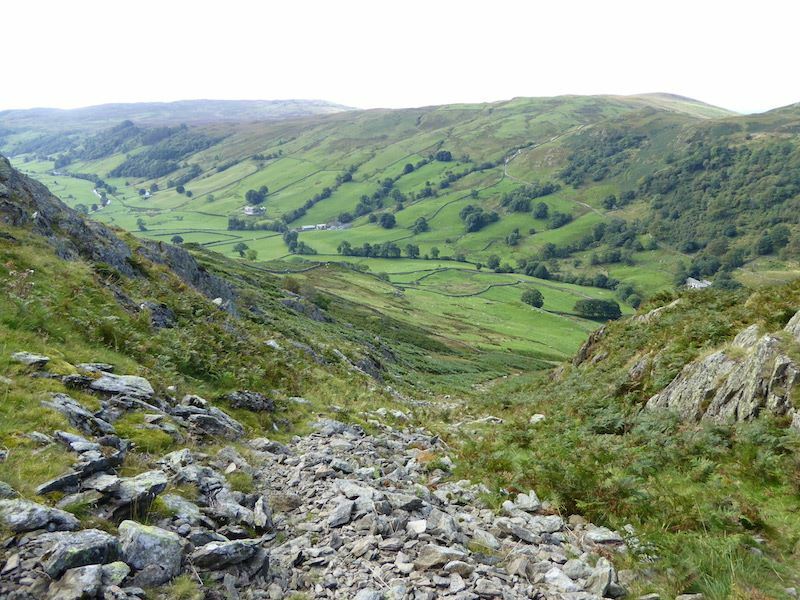 A look back to Grey Crag and the soggy area in between. We made it across without getting our boots full. 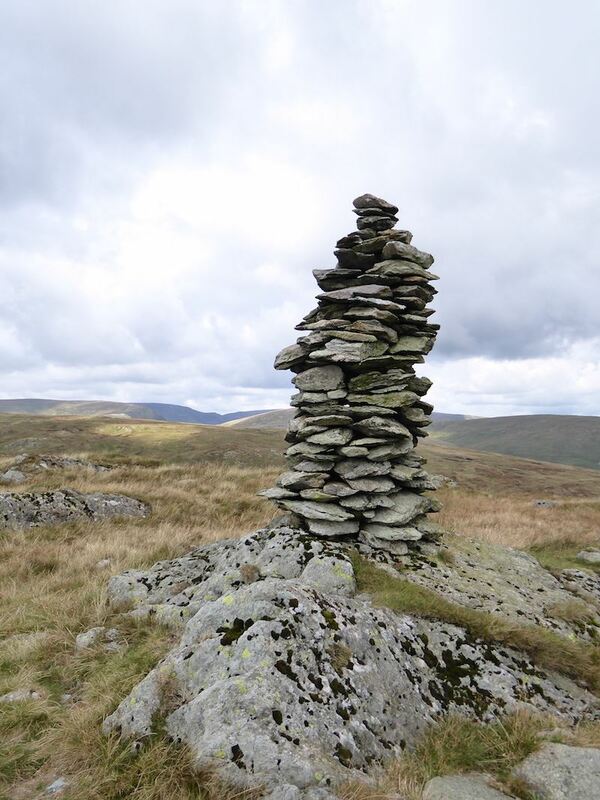 Tarn Crag summit cairn and the old survey pillar. We had a refreshment stop on Tarn Crag and by now we had our windproofs back on again, I even ate my sandwiches wearing my gloves, my hands get cold very quickly so I try to prevent it happening. The pillar has been there since the 1930’s, so its not surprising that vegetation is taking it over. 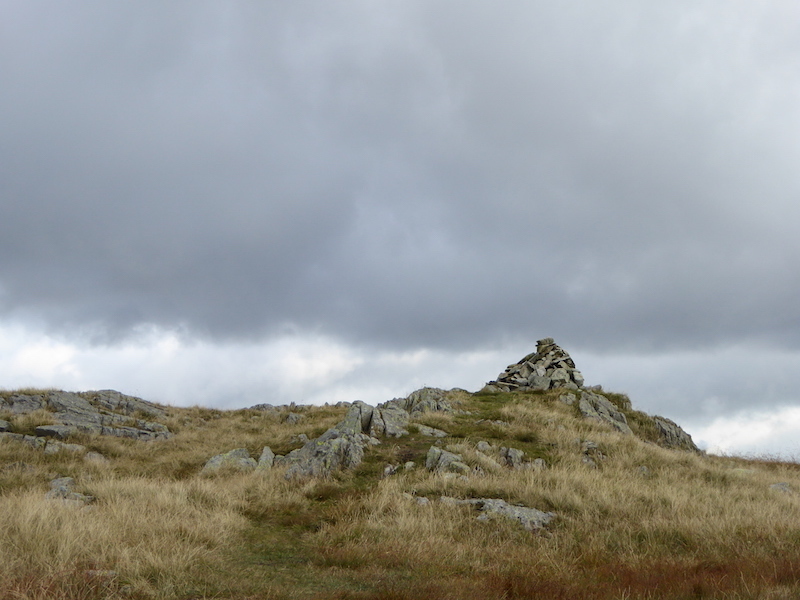 Its cold and windy now on Tarn Crag. We didn’t linger long on Tarn Crag as it was now quite chilly and a wind had got up, so we decided to make a move and get back down just in case it started to rain. As we descend from Tarn Crag we have a view of Harter Fell on the left, and Branstree on the right. 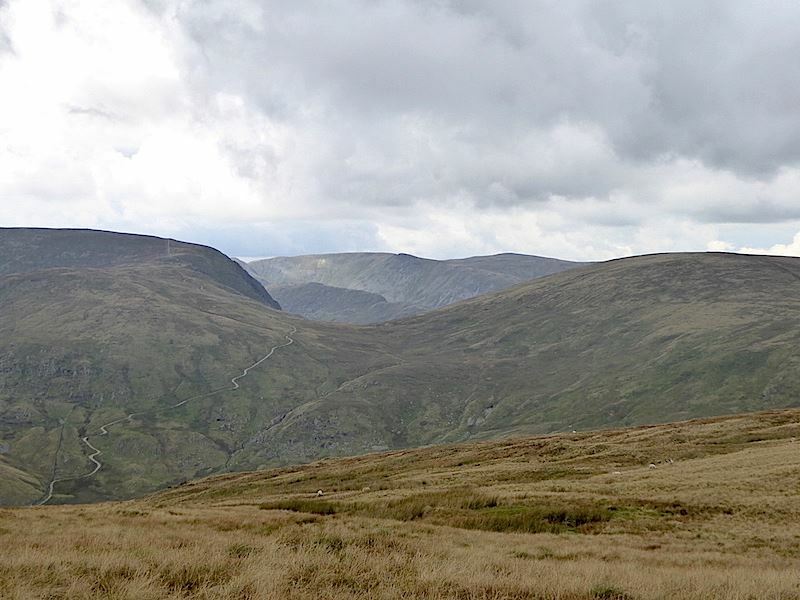 The two fells on the skyline in the middle are Kidsty Pike and High Raise. 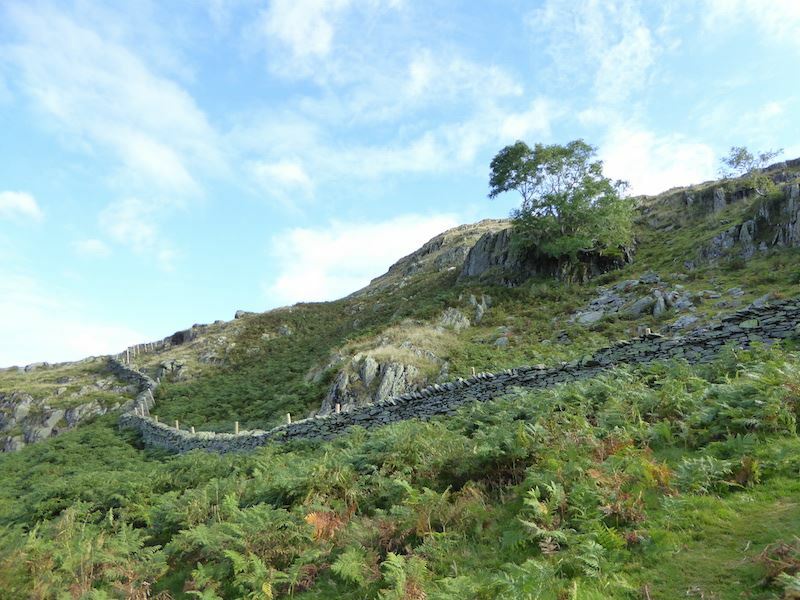 The path running up Harter Fell is the one coming up from Sadgill. 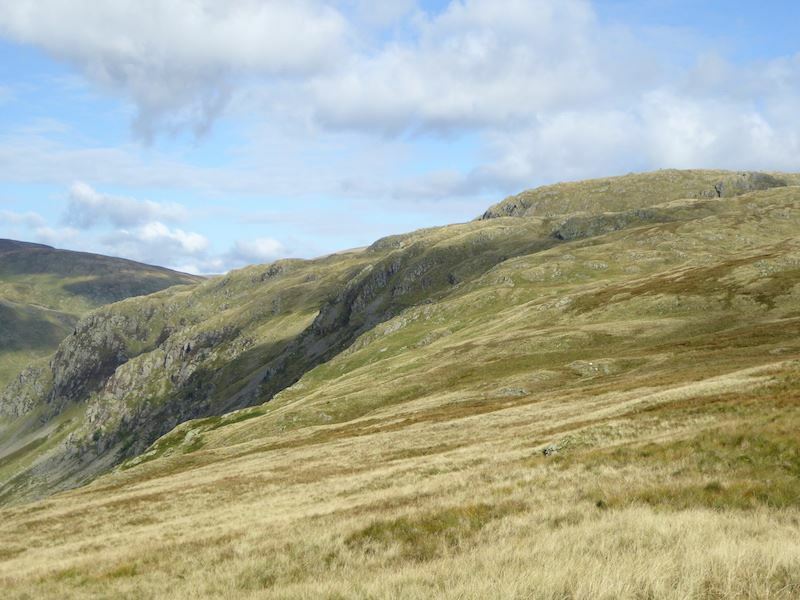 A close up of Harter Fell with the Wrengill quarries on the left. 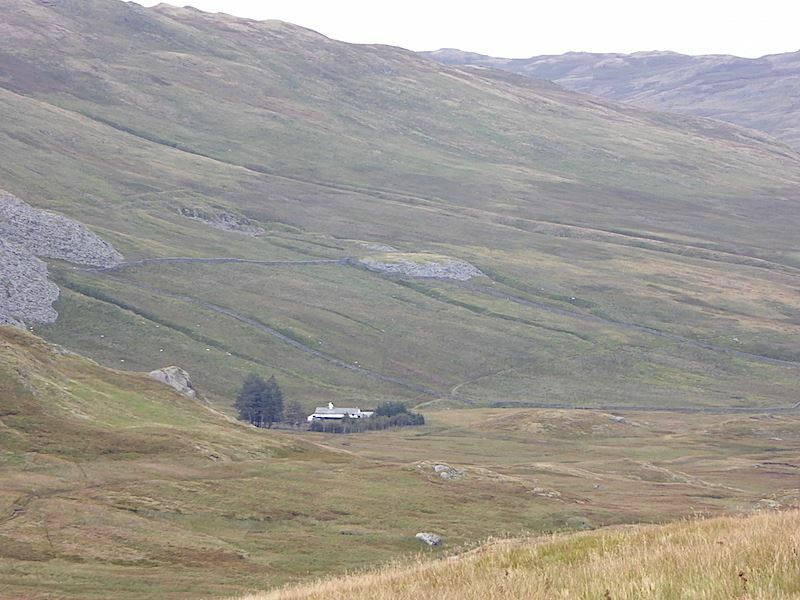 Over there is Mosedale Cottage, once inhabited but now used by walkers as a bothy. Its a remote place. 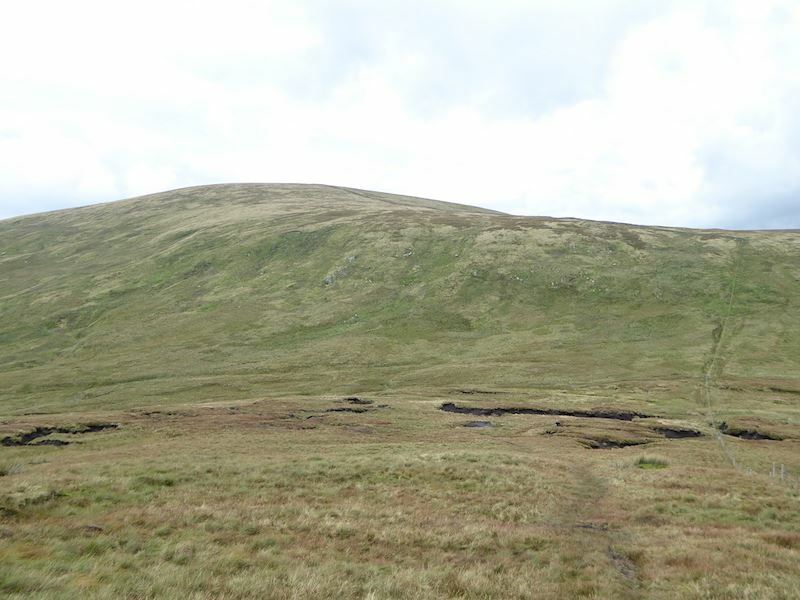 We’re approaching the peat hags in the depression between Tarn Crag and Branstree opposite us. Another very wet area. 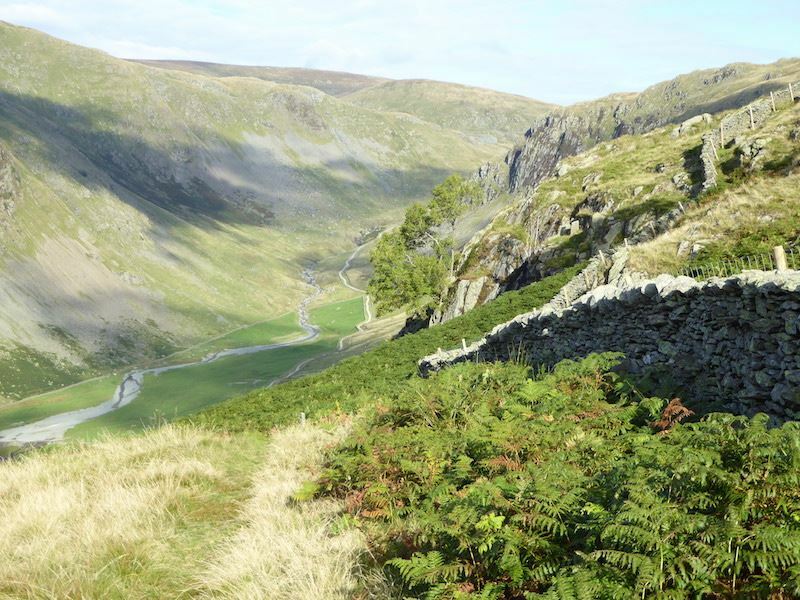 As we descend alongside the fence, over to our right is the remote, isolated valley of Mosedale where the bothy, shown in a previous picture, is situated. When we reach the depression, just in shot over to the right, we’ll turn left and head down to Brownhowe Bottom. 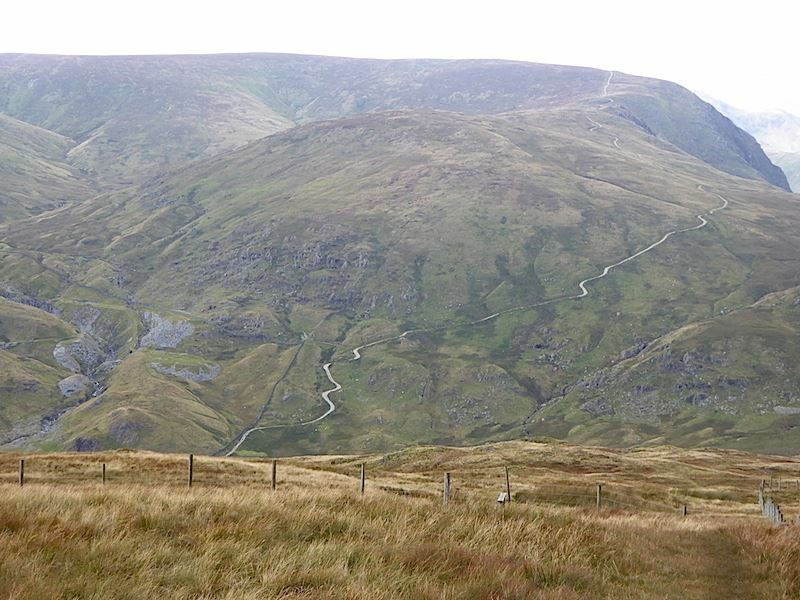 A close up of Wrengill Quarries below Harter Fell, a red tractor, carrying some logs, moving along the path. We’re now down at Brownhowe Bottom, but that’s not the same tractor as in the previous picture, and there was no sign of any driver for it. From Brownhowe Bottom we join the path down Longsleddale back to Sadgill. 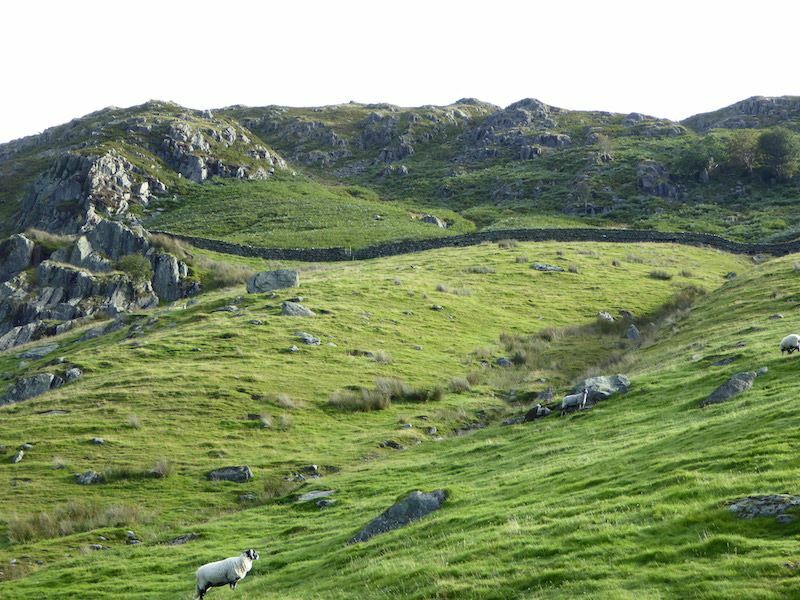 In this view the path continues on up to Harter Fell. 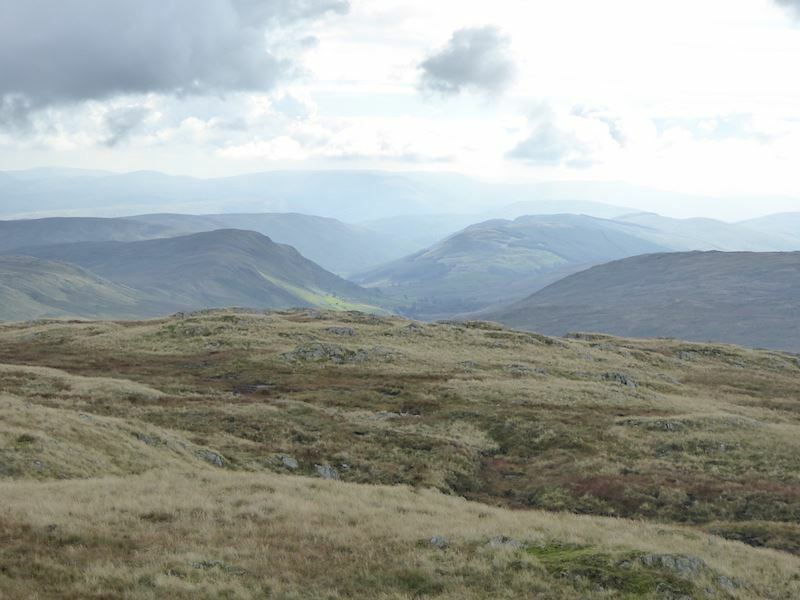 As we reached this point, and were in the process of removing our gaiters, the young lad we had met on Grey Crag came bounding down the path from the direction of Harter Fell. 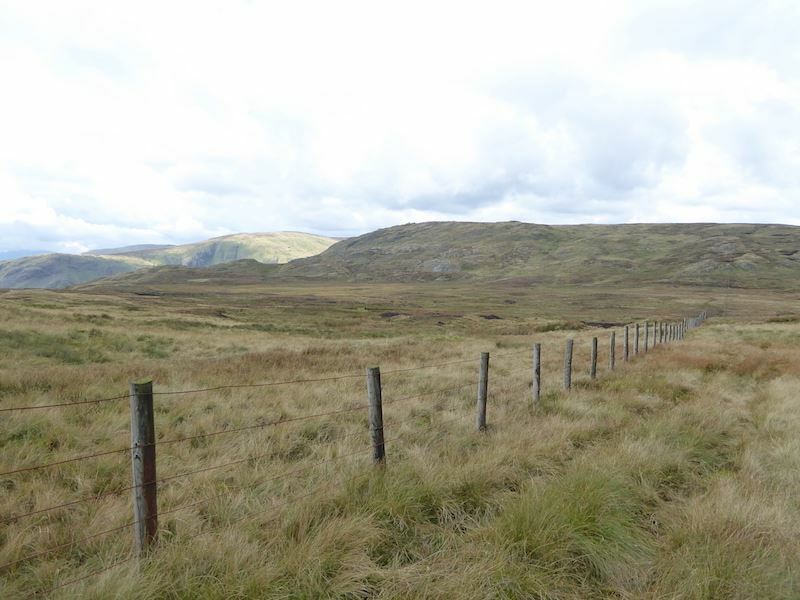 We guessed he must have gone the same route as us as far as Tarn Crag and then gone up Branstree and Harter Fell from there on. 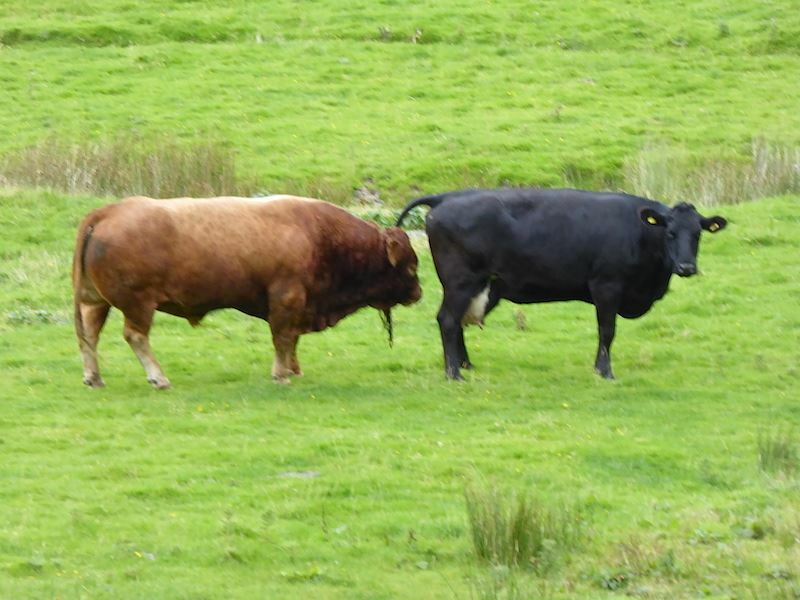 He was still full of chat and energy and once again he stopped for a few word before bounding back down into Longsleddale. 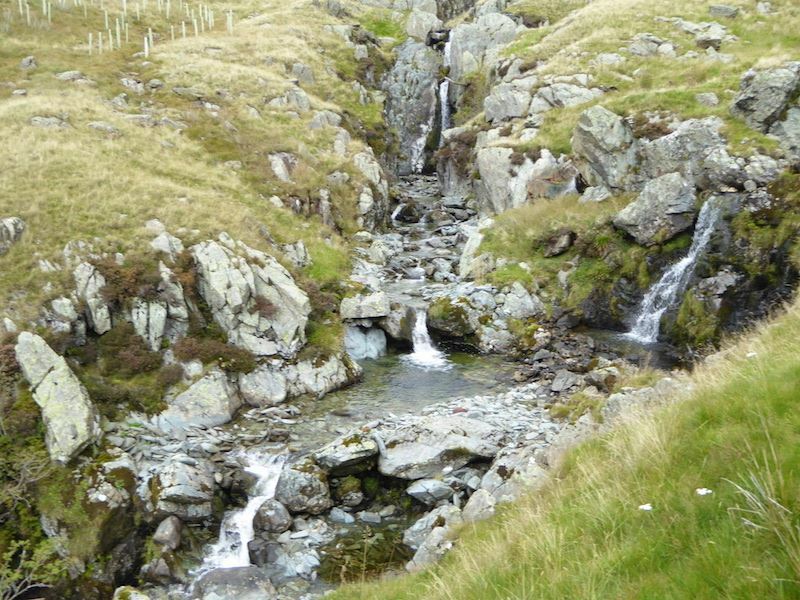 We had a leisurely stroll down Longsleddale, stopping from time to time to look over walls at the waterfalls in the gill. 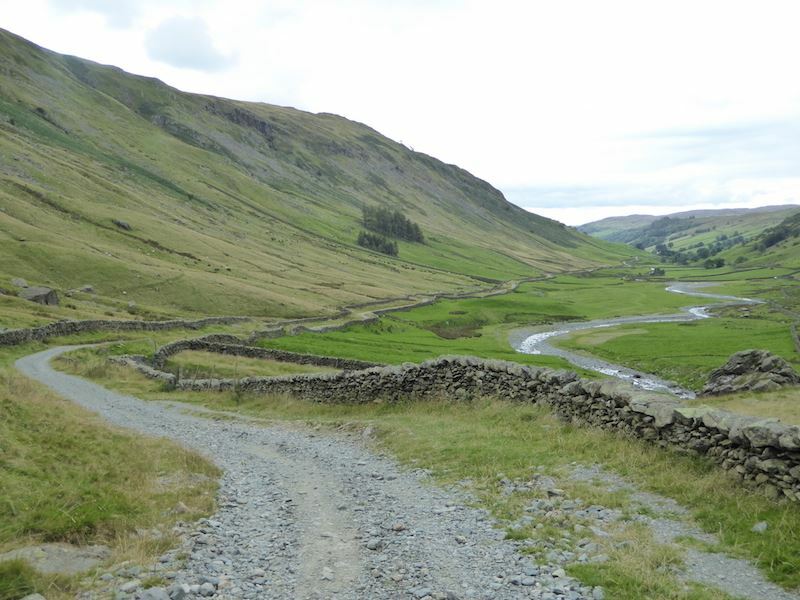 The long walk back down Longsleddale to Sadgill. The River Sprint meandering alongside the path as we make our way along the valley. 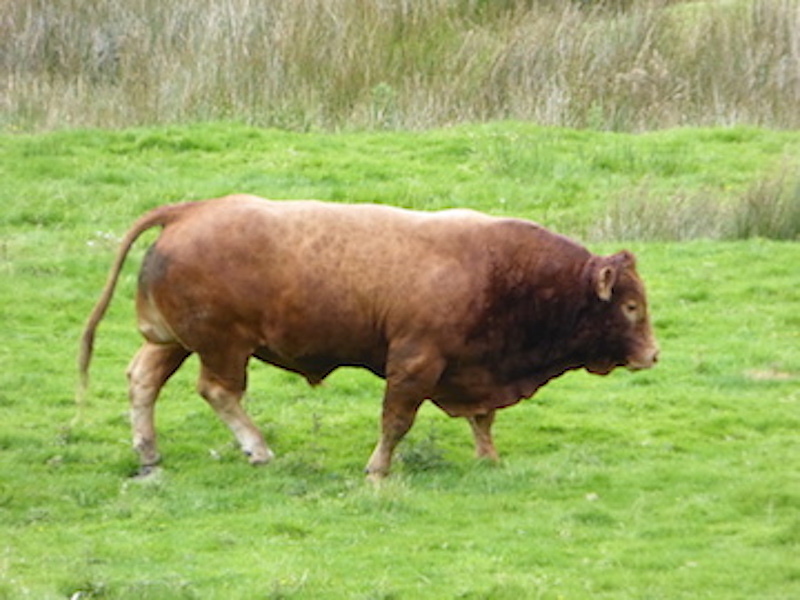 That is one very big piece of beef, he was so huge he could barely walk. You can provide your own caption if you wish, I’m making no comment! 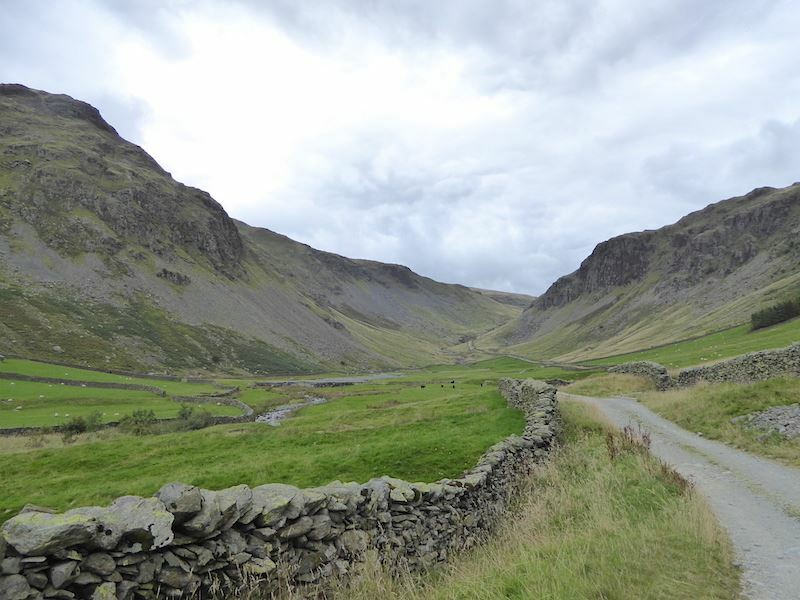 Back at Sadgill where 6 more cars were parked up so there were other walkers somewhere around. A couple eventually came down the track but didn’t get into any of the cars, and they were followed by a man who did own one of the cars. He was still changing his boots as we drove off. Apart from these, and the bounding young lad, the only other people we saw all day was another couple who were coming onto Tarn Crag just as we were leaving it. The holiday season is well and truly over it would seem. 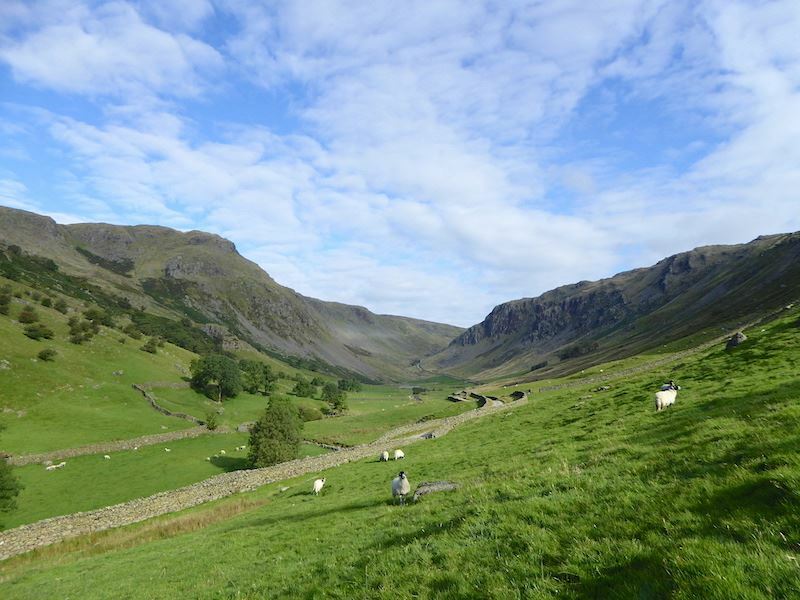 A last look up Longsleddale now that we’re back at Sadgill. The day started nicely enough so it was a bit of a disappointment when the dark clouds came over. However it didn’t rain and that’s always a bonus.